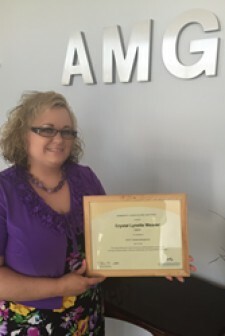 Greensboro/Winston-Salem HOA and Condo Manager Weaver Completes Management Program | Company Newsroom of Association Management Group, Inc.
April 26, 2016	(Press Release) - Crystal Weaver, CMCA (Certified Manager of Community Associations) at Association Management Group - Greensboro (AMG), one of the Carolinas' largest professional homeowner association managers with five offices in North and South Carolina, recently completed the national M-201 Facilities Management curriculum. This is the first of two courses of study Weaver is taking to achieve the rigorous AMS (Association Management Specialist) certification in September. The AMS is a credential from CAI (Community Associations Institute), the industry's international membership organization dedicated to building better communities. The M-201 instructs participants in how to successfully manage and maintain community physical assets to protect and enhance property values, including common area maintenance, disaster preparedness and the bidding and contracting process. According to AMG President Paul Mengert, the M-201 provided invaluable best practices to Weaver, who manages townhome, condo and single-family HOAs at AMG. "Thanks to this course, Crystal will be prepared to guide and assist client communities in the planning of minor to large maintenance projects," he said. "With her deeper knowledge on the process of bids, proposals and contracts, she'll be able to support volunteer boards in choosing the best contractors for community maintenance jobs. Her new expertise also enables her to share the best preventative, routine and emergency maintenance policies and procedures to fit the community's needs." Weaver, a graduate of CAI's exhaustive CMCA management certification program, believes the more she can learn about her profession, the better able she is to serve customer communities. "Success is no accident. It's hard work, perseverance, learning, studying, sacrifice, and most of all, a love for what you do," she said. "I have learned so much and it pushes me to go even further. I'm thankful for the opportunity not just to have a job, but to have a career I love!"